Who doesn’t love a nice game of disc golf? There’s really nothing better than a sunny day on the disc golf course. I’m sure if we could, many of us would play every day. Unfortunately, life gets in the way sometimes. We all have commitments to work, family, friends and ourselves that prevent us from taking an hour or two to play 18 holes. That’s why portable disc golf target baskets are so awesome; they let us bring the sweet satisfaction of nailing a 20-foot putt to our backyards—or anywhere else we desire! 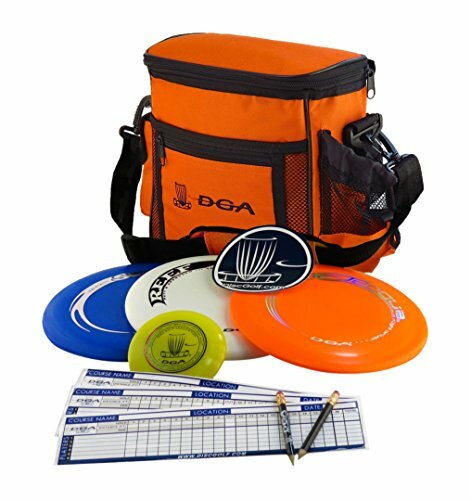 In this review, we’ll discuss five portable disc golf goals. I’ll break down their key features and even note some pros and cons for those of you who don’t want to read the whole thing. First let’s take a look at the top rated portable disc golf targets, then we’ll talk about how to choose one in our buying guide below. We’ve gathered five good models that range widely in price, weight and other attributes. Hear us out and decide for yourself which is the best. As the name implies, this target is ideal for travel. 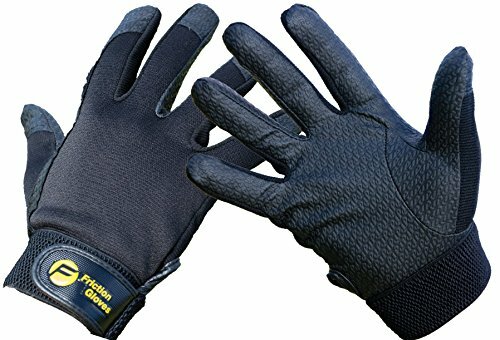 It’s great for taking to the beach, going camping, or simply setting up in your backyard. The DisCatcher is collapsible and light, weighing a mere 15 pounds. It’s quickly and easily set up in a single action. Targets come in red, blue, and yellow, with matching bags. 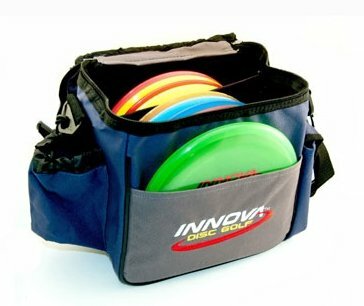 While the Innova DisCatcher Travel is light, it can withstand moderate winds and uneven surfaces by anchoring into the ground. That said, there is some wobble or kickback when you successfully land a shot due to the target’s low weight. The DisCatcher provides a close simulation to the real thing—its regulation size and 12 steel chains perfectly simulate a permanent course target, so you can improve your game from the comfort of your backyard or local park. As far as price goes, this target is actually pretty good Despite being made by an industry leader with high notoriety, it’s on the lower price end of targets in this review and is probably the best portable disc golf basket in general. Portable and easy to assemble, Driftsun’s disc golf goal is a solid target for very little money. The entirety of its construction is made out of metal, which means it can remain outdoors for long periods of time, unlike other models. Despite its metal frame, it’s not unreasonably heavy for a portable target. One of the deficiencies of this product is its rigid, circular frame, which makes it hard to place the target on ground that isn’t level or flat. 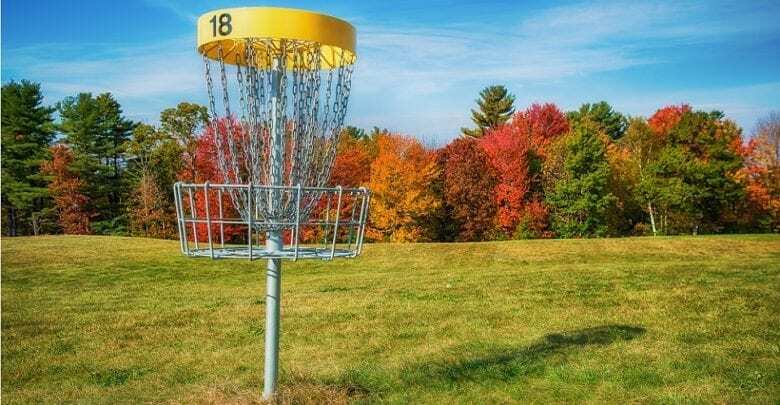 The one downside to the Driftsun disc golf target is there is only one round of chains, meaning that discs have a higher probability of flying through the chains than on a normal target. This can be somewhat frustrating, especially if you’re playing seriously instead of just messing around in the backyard. If this really bothers you, you can easily add another set of chains. The quality to cost ratio on this target is pretty high. In simple terms: it’s a lot of bang for your buck! If you’re looking for a target to set up on a permanent basis, this probably isn’t the one for you. But if you’re looking for the best disc golf target, this is the one for you. The last portable target we’re going to discuss is the DGA Mach 2. 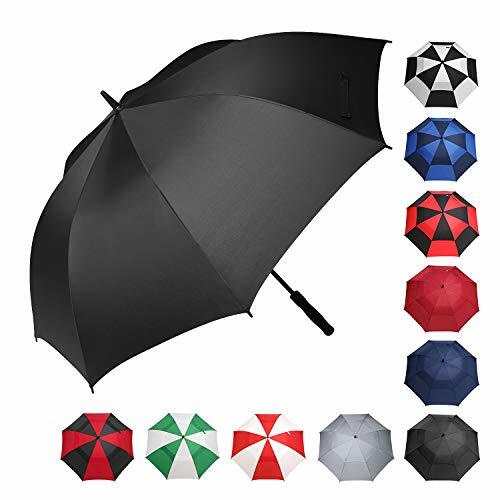 It stands out among the others in this review for its weight: 40 pounds. It’s the closest to a regulation target you will find. It has two rows of chains so it will catch your discs every time. It’s roughly six feet high from the ground to the top of the flagpole, but it comes with an adjustable height to make it more palatable to smaller players. 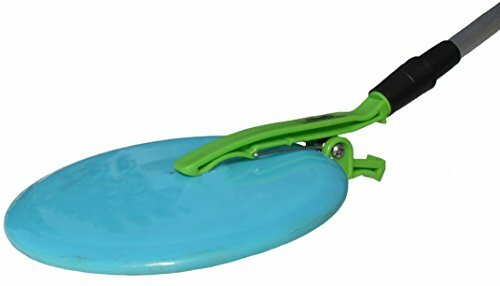 At 28 inches, its diameter is slightly wider than the conventional disc golf goal. Like the other targets we’ve reviewed, it’s quickly and easily set up. the Mach 2 has three quick-release pins that make setup an easy affair. Its relatively compact as well. This target is weather resistant, being constructed of galvanized steel. It’s a good thing, too; at 40 pounds, moving this thing inside during a storm might get a little annoying. Like the previous two models, it stands on a circular platform but the DGA can be anchored in the ground for permanent installation. Aside from its weight, the most notable property of this target is its price. 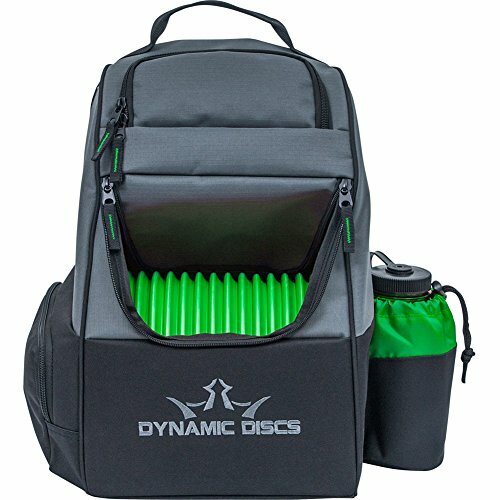 It’s one of the most expensive portable targets out there, but if you’re looking for the best disc golf basket, this is it! 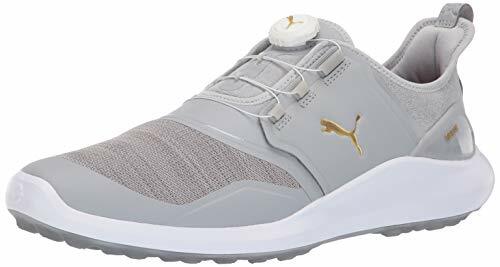 The specs on this model are completely in line with regulation disc golf baskets. Target diameter is 25.5 inches, and the diameters of the outer and inner chains are 21 inches and 15 inches, respectively. Though the Black Hole Pro is a portable target, its design helps it feel more like the real thing. At 25 pounds, it’s a pretty sturdy model. All construction is metal, and all joints in the target are welded together. Despite all of this, it takes roughly a minute to set up, according to the manufacturer, and requires no tools to set up. One thing about the Black Hole Pro is that it only comes in black, which isn’t exactly ideal for playing in the woods. It also doesn’t come with a wind-revealing flag, so its visibility leaves a little to be desired, I suppose. Another drawback of this particular target is its price. It’s more than twice as expensive as the Pacific Outdoors target we talked about earlier. That said, if you’re intent on replicating the feeling of playing on an actual course, you can’t do any better than this. The DGA is similar to the Inova DISCatcher in it’s a very lightweight and portable weighing in at only 25 pounds. Even though it’s so light and portable it’s regulation size and plays just like a basket will will find on the course. Unlike cheap folding Disc Golf targets, the DGA folds up easily and quickly. You can count on the Mach lite for long life. The chains are zinc plated for rust and corriosion resistance. The nylon basket is made from rugged nylon that is UV resistance, making it perfect for taking to the beach or just practicing in your backyard. The only real downside we can find with the Mach Lite, is it is on the expensive side but you really do get what you pay for! With the Mach Lite you will be able to practice your shots or have a competitive game with friends and family! As always, the ideal product is going to depend on what you’re interested in. With that in mind, here are some generally important things to watch out for when buying a goal. If you care about having an authentic feel to your disc golf goal (probably because you want to practice on something resembling a regulation target) you should pay attention to its dimensions. You can check out PDGA standards here. Another thing that will influence how closely it resembles a regulation is the number of chains a goal has. Regulation goals have 24 chains—12 outside, six middle, six inside—which are what keeps discs from shooting through them. The weight of the chains is also important for obvious reasons. If you’re not looking to emulate a traditional goal, you should be aware of the existence of intentionally narrow goals. The point here is to practice your aim on a less forgiving target, thereby improving your accuracy and preparing for the real thing. There’s a great range of weight among portable disc golf targets. Some are designed to be brought anywhere and can fit in a backpack. Others are on the larger side and too heavy to carry for a far distance. Goals that are entirely constructed from metal tend to be heavier and bulkier. The upside is that they also tend to be more stable and resilient to the force of Frisbees colliding into them. “Hybrid” goals—those constructed from mixed materials, such as metal and mesh fabrics—are lighter and more easily brought from one location to the next, but aren’t as durable and can’t be left outside for long periods of time. Some people are interested in portable goals but don’t necessarily plan on moving them around a bunch. These people should look for heavier metal models, while others, who want to take their goals to picnics or on camping trips, should opt for hybrid models. The Innova DISCatcher Traveler is the best example of a portable target. 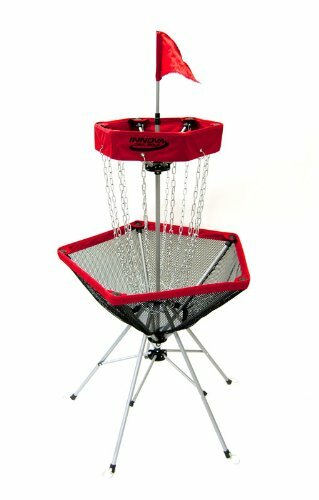 I hope this guide was helpful for finding the best disc golf basket to fit your needs. If you want to comment or recommend a target I didn’t include, please use my contact form to get in touch. Okay, that’s all for this review. Enjoy your new target, should you decide to buy one!